This workbook is designed to accompany section 209 - Child FLOs. Perhaps we are doing a Marketing campaign and want to reach only our Twitter followers in a particular location or area and are active. NOTE: This FLO won’t be fully complete … we’re just demonstrating how to call a Child FLO. While this is a rather basic Child FLO, it shows how we can pass information back and forth easily! Perhaps I have a list of contacts and I want to traverse this list and send an email to every person on that list. Within a FLO, this would be a “For Each” action. Here, we’re going to do the following: Take a ;ist of contacts and traverse this list and send an email to people that match a criterial on this list. This is an important key in working with Child FLOs! They come directly from the item that is being processed, so if the object you’re processing has field X and Y, you’ll need to add those here. We want to send email to people on this list, so we’ll take each email - one at a time - and do something with them. NOTE This depends on your email client. If you have Gmail, use the “Gmail >> Send Email” card! Important: Note that this whole idea of child FLO is that you can do as many steps as you need on each item – one at a time. 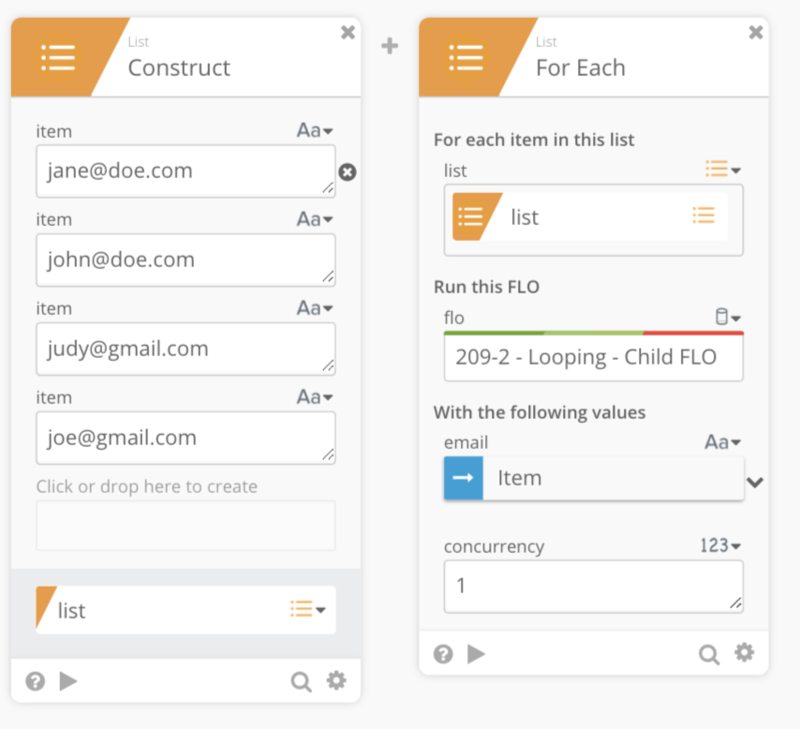 Go back to the parent FLO and complete it … Note that the “email” field that we created in the Child FLO **now appears as an item in the “With the following values” section! Now run the FLO and make sure you’re getting the correct output.